Cannon Car Mats are No Longer Available in Custom and Universal Fit Designs. Note : As of 28-May-2015 it appears as if Cannon Car Mats manufactured by Cannon Automotive LTD in the UK has gone out of business or moved with no forwarding address. The company website is down. The following information is for historical information purposes only as this company no longer appears to be in business making car floor mats. For more information on purchasing car or truck floor mats please visit our main page for Car Floor Mats. Note2 : As of 30-Sep-2016 it appears reasonably sure Cannon no longer manufactures car mats. You can no longer easily find Cannon Car Mats in distribution or for retail sale. Cannon had problems with MacNeil Automotive in a joint project making car mats for Hyundai and others. There was some court action related to Cannons carpeted/rubber mats delaminating (the rubber and carpet part of the mat separated). The ultimate results are unknown to us. Cannon was owned by C.A. Holdings of London, England. Charles Atkins is a director of C.A. Holdings. Why not check out WeatherTech to replace your Cannon Mats. The company manufactures their products in the USA and the WeatherTech mats/liners are certainly an upgrade to the older Cannon products. 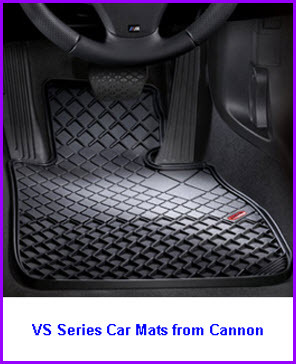 Cannon Car Mats are manufactured by Cannon Automotive Ltd in the UK. The company has been around for over 60 years making all kinds of rubber things, like hot water bottles and baby products. Tradesman Truck & Van Model is a heavy duty, universal fit car mat for guess what? Ya, you're right - for Trucks and Vans. The mats are 687mm deep and 480mm wide so they ought to protect your truck or van floor from most of the despicable stuff you bring in on your boots. And if they don't fit perfect, remember, you can trim them down till you're happy. The Profile III is a semi-universal fit car mat. You get 4 mats, 2 for front and 2 for back, in the set. Cut lines are integrated into the mats and also act as channels to direct water away from your feet. There's an anti-slip pattern on the back of each mat to help keep its position on the floor. The 4X4 Cut to Fit set of Cannon Car Mats is designed to cover the front or the front/rear floor of your SUV, all wheel drive car or other 4x4 vehicle. You can buy a set of front mats (2) or a set of 4 mats for front and back. Same as Profile III, but not as heavy duty. Tailored, custom fitting mats in over 100 shapes and designs. For Citroen, BMW, VW, Alfa Romeo, Audi, Ford, Mercedes, MG and most other cars. These mats are more sophisticated than the universal fit Cannon Car Mats. They have a thicker heel pad, a recessed area to scrape dirt and snow off your shoes, nibs on the underneath of the mat to prevent slippage and you don't have to trim them to make them fit nice! Made for larger cars and trucks, these mats have hidden cut lines on the underside of the mat to enhance the aesthetic appeal of the mat. Perfect fit, no trimming required on these luxurious, deep pile, tufted . carpeted mats. Nibs on back prevent mat slippage. Semi-universal fit, carpeted car mats. Thick, hard wearing carpet. An economical alternative to the Platinum Series.